Challah bread is pronounced “hallah” and is also called egg bread or sweet bread. It is one of my all time favorite bread recipes. It has a richness from the added eggs and is just slightly sweet. Challah bread is a traditional Jewish bread that the rest of the world has adopted as their own. If you haven’t tried it yet, this one is a must try for bread makers and bread lovers. This egg bread is wonderful used as toast, in egg salad sandwiches, tuna or chicken salad sandwiches. In a small bowl, combine the water, yeast and 1 teaspoon of sugar. Leave the mixture to stand for 3 minutes and then stir until the yeast is dissolved. Then leave it for a further 5 minutes. Combine 4 1/2 cups of flour with the salt and remaining sugar in a large, deep mixing bowl. Add the yeast mixture, then add the eggs and vegetable oil. Gently stir until the ingredients are blended together. Stirring more vigorously, blend in the remaining flour. Turn the dough out onto a lightly floured surface and knead for 20 minutes. Place the dough ball into a bowl, cover the bowl with a clean cloth, and let it stand for 45 minutes or until the dough has nearly doubled in bulk. Turn the dough out and knead for 5 minutes. Let it rest for 5 another minutes. Cut the dough in half with a sharp knife, then cut each half into thirds. Roll each piece of dough into a long cylinder that tapers at each end, somewhat cigar shaped. Pinch the ends of the 3 long dough pieces together at one end. Braid the 3 pieces, then pinch the other ends together. Repeat with the remaining dough. Place the each dough braid on a lightly greased cookie sheet and leave them to stand for 30 minutes. 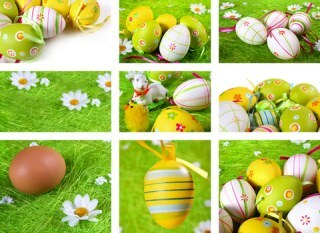 In a small bowl, beat the egg yolk with 2 tablespoons of cold water. Brush the tops of the challahs with the egg yolk and bake for 20 minutes. Reduce the temperature to 375°F and bake for 30 to 40 minutes more, or until the challah bread is a nice golden brown and sounds hollow when you tap it. Cool on a rack before cutting. 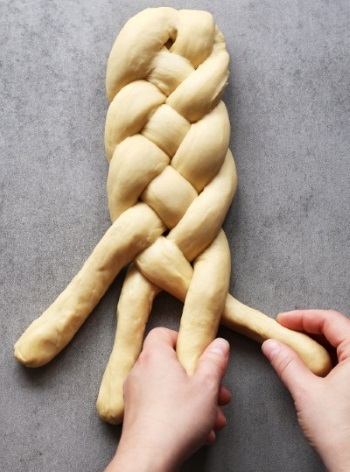 The recipe mentions braiding the challah dough into a 3 part braid. This image above shows you how to do it in a 4 part braid. If braiding isn’t your thing, and it’s not really mine, just form the dough into a nice loaf and it will be just fine. 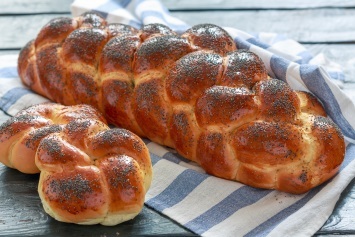 Challah breads are often seen covered in poppy seeds or sometimes sesame seeds. To do that, just sprinkle the seeds over the dough right after you brush it with the egg yolk. The seeds will stick to the wet egg. This dough makes great buns too. Just pinch off smaller pieces and bake them for a shorter time. I usually talk about how to make a recipe healthier, and for breads I often suggest replacing at least part of the white flour with whole wheat flour. The truth though is that this luscious sweet bread really does need to be make with white flour to taste the way it is supposed to. So go ahead, make this great egg bread recipe and enjoy. This wonderful bread recipe has light flavor that may make you think it is difficult to make but nothing could be further from the truth. Just follow our simple directions for sweet and delicious challah egg bread. Challah bread is just one of our delicious quick breads, muffins and bread recipes. Find them all here. Great recipe, easy, wonderful taste….. but DON’T bake it as long or as hot as it calls for….. 350 is plenty hot and 25 – 30 minutes tops!! My first 2 loaves were beautiful but WAY over baked and I shaved about 15 minutes off the time…. Next batch I will bake even less time! Great recipe though!